How to work and connect with others over different time zones if you're expanding your business into international markets or working with overseas teams. If you want to expand your business into international markets, one thing you will have to get used to is working with different time zones. The internet has made going global easier than ever before and even small companies and start-ups are now looking at overseas markets as a route to achieve business growth. New technology and the ease of web conferences can make an international ‘meeting’ cheaper than one in the UK, as you won’t even need to leave your workplace - whether that's an office or your home. But while it can be exciting to build a work environment with no boundaries, dealing with the difference in time can be exhausting. It sounds obvious, but if you are dealing with a supplier in China you need to know exactly what time it is there when you make that conference call. If you have a good knowledge of the time difference between the UK and all the different places you are doing business, you will avoid embarrassing mix-ups and failures in communication. Also, when arranging conference or Skype calls, make sure you're clear and consistent in your use of time zones. Confirm the time of the meeting in both time zones, for example if you're arranging a meeting with someone in the US, state clearly. "the meeting will begin at 5pm GMT, which is 9am PST for you". 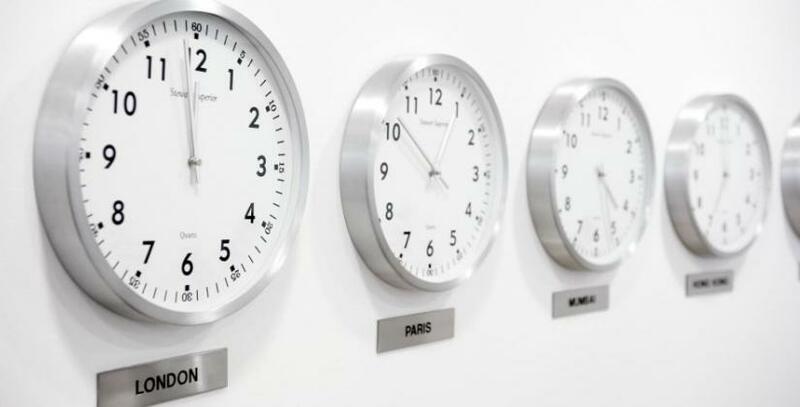 Alternatively, set your meetings specifically using UTC (coordinated universal time), to avoid any misunderstandings between time zones. Make sure you track daylight saving changes, so that you get your times right for each zone and bear this in mind if you schedule meetings months in advance. The world clock is a great resource to check what the time is in different parts of the world. If you need to make a call at an unusual time to speak to someone in a different time zone, set yourself an automatic reminder. Don’t simply rely on your ability to remember, especially if it involves getting up early or staying up late. Emails give us a way of communicating with each other 24 hours a day, but this can have its downsides. If you keep trying to reply to messages straight away, you’ll end up feeling exhausted and less productive. Accept that you may not be working the traditional 9am - 5pm (if you actually do to begin with), but give yourself work boundaries and stick to them. Unless you’ve agreed to communicate during your night for a particular reason, switch your phone onto silent and deal with the emails in the morning. If you have a regular call with someone in a different time zone, try to set your call in a period that overlaps both of your working days. If that's not possible, you could consider varying the time, so it isn’t always the same people who have to work at an unsocial hour. Take it in turns to be the one who has to get up before dawn or stay up late. Simply by thinking about the time difference and being considerate to others will make a big difference to how people feel about working with you. However, if there are more than just a couple of you on the call, it may be best to stick to specific times to avoid confusion and/or people missing the call. It's not just time zones you need to consider when working with people in different countries. Think about cultural differences too. Some countries are more formal in their communications, while others are more aggressive or blunt. In some countries, it would be rude to be late for your conference call, while others are a little more laid back and may keep you waiting instead. Having an awareness of what to expect will help you to prepare and make the most of your meeting, particularly in in the early stages of any business relationships.